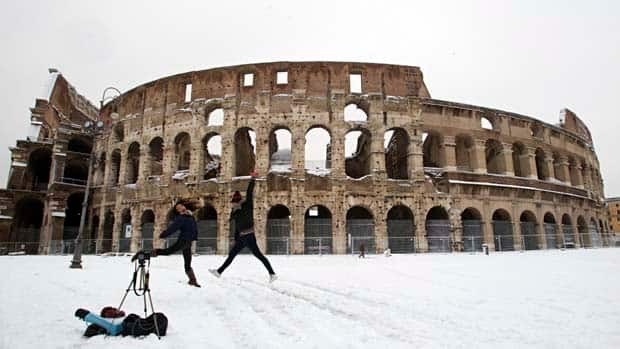 Heavy snow has caused extensive damage to the mediaeval walled town of Urbino and further deteriorated the Colosseum in Rome, already badly in need of repair, Italian newspapers reported on Tuesday. Partial collapses have been reported at the convents of San Francesco and San Bernardino in Urbino and the roof of the Church of the Capuchins outside the town centre has completely caved in, La Repubblica reported. There is also water damage in the town’s 12th-century Duomo cathedral. The roof at the Church of the Holy Cross in the nearby town of Urbania also collapsed and a collection of paintings, drapes and ancient globes has had to be removed from the town’s Ducal Palace due to fears of a collapse. Thirteenth-century church doors in the town of Cagli have also been damaged. In Rome, fragments have fallen from the Colosseum which remains closed to tourists. The famous Roman amphitheatre, which is at the centre of a busy road junction, is blackened by pollution and has been losing pieces for years.